Keto Pepperoni Chips - Easy 1 ingredient Recipe - Very Tasty! 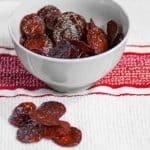 Baking Pepperoni slices turns them into a great Keto Snack - Keto Pepperoni Chips. Not only do they fulfill those cravings of crunchy foods, but they are also the perfect vessel for dips, cheeses and sauces. Preheat fan forced oven to 200C/400F. Line a baking tray with parchment paper and place pepperoni slices in a single layer on top. Bake for 5 minutes then removed from the oven and sponge off excess oil with a paper towel. Return to the oven for 1 minute longer to crisp up. Remove from the oven and layer on a paper towel for 2 minutes, then enjoy!